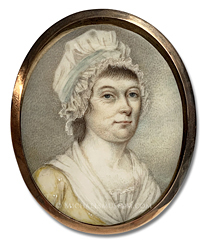 About the Artist: Joseph Dunckerley (alternatively spelled as Dunkerley or Dunkerly in some sources) was born in London in 1785, the son and grandson of London jewelers. He arrived to Boston, Massachusetts in 1774 with the 38th Regiment of Foot, a British Army infantry regiment, in which he served as a private. He deserted the British Army in January, 1776. In May 1776, he joined the Massachusetts Company of Artillery, in which he served as a 2nd lieutenant. In March, 1777, he was commissioned in service of George Washington's Continental Army as a 2nd lieutenant and adjutant. 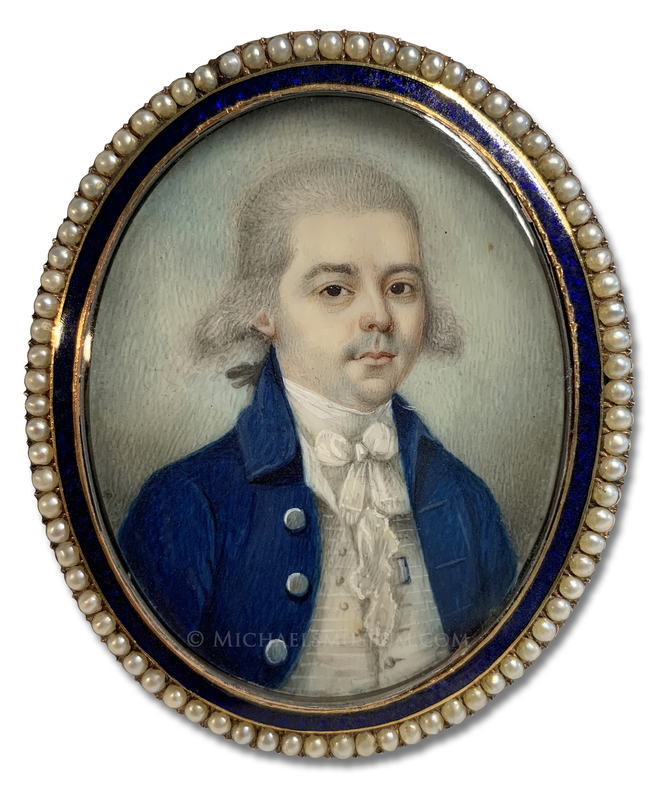 In May, 1778, he resigned his commission in the Continental Army and settled in Boston, where he commenced painting miniature portraits professionally. 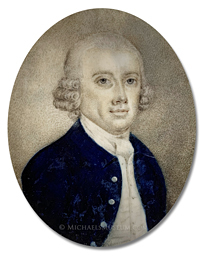 In 1787, he departed Boston and relocated to Jamaica, then a British colony. In Jamaica, he initially settled in Falmouth, where he painted miniatures. By 1794, however, he migrated to Kingston, where he was actively involved with Freemasonry. In 1796, during a period of unrest and uprisings, he joined the Jamaica Militia, serving as a lieutenant and adjutant in the St. Andrew's Regiment. Listed by Barratt and Zabar (page 91), Blättel (pages 314, 315), Bolton (page 38), Bolton & Wehle (pages 79, 80), Fielding (page 257), Johnson (page 115), and Schidlof (page 225). Click here to read a more in-depth article on the life and times of Joseph Dunckerley.